In January and February of 1991, 38 Iraqi Scud missiles landed in Israel (four others fell short and landed in the West Bank). The bombardment started on January 18, when Tel Aviv and Haifa were hit by 8 Scuds, and continued for several weeks. 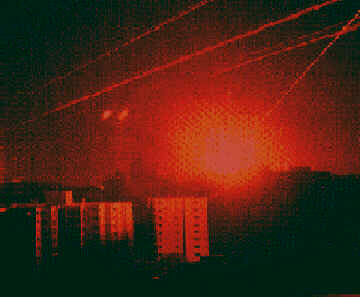 Six missiles fell in the Negev, apparently aimed at the nuclear reactor in Dimona. All of the Scuds had conventional warheads, although Saddam had previously used Scuds with chemical warheads in his war with Iran. The Scuds were of Soviet design, based on the German V-2 developed for Hitler by Werner von Braun. Israelis put on gas masks and huddled in sealed rooms during the attacks. Only one Israeli was killed directly (this has been termed ‘miraculous’), but “15 died of heart attacks, suffocation in their gas masks or reaction to a chemical-weapon antidote that some took in a panic” [Time]. There was great fear of chemical attacks, especially since the Scuds’ propulsion system used red fuming nitric acid as an oxidizer, which was extremely irritating when inhaled or on the skin. The Bush I administration requested (i.e., ordered) Israel not to take any military action against Iraq, because the presence of Israel would damage the anti-Saddam ‘coalition’ that included such countries as Syria, the Gulf states, Saudi Arabia, Pakistan, etc. Of course the lion’s share of the actual fighting was done by Western nations, particularly the US. Saddam invaded Kuwait and directly threatened Saudi Arabia. The US and other Western nations, with token ‘participation’ by some Arabs (Saudi Arabia committed the most forces, but was little help) liberated Kuwait and defended Saudi Arabia. Because of Arab sensibilities, Israel was told to hold still and absorb what — but for incredible luck or divine intervention, take your pick — could have been a catastrophic attack. What’s wrong with this picture? What’s wrong with a situation in which the Jewish state, which was created and maintained at great cost, in part so that the Jewish people would no longer experience pogroms or worse, was prevented from acting in self-defense — because the Arabs’ rejectionist ‘honor’ apparently was more important to Bush I than Jewish lives? Like the 1930’s when the British chose to restrict Jewish immigration into Palestine and to condemn hundreds of thousands of European Jews that might have been saved rather than annoy the Arabs, we know that our concerns are not the same as those of the great powers. But that’s why we Jews have — or thought we had — a sovereign state. The US promised to take care of the Scuds for Israel. They deployed highly ineffective Patriot missiles and flew numerous sorties into Iraq, including intensive B-52 bombing raids, with little or no results. The mobile missile launchers were elusive and could be set up and fired quickly. He was probably sorry on February 25, when an army barracks in Dharan, Saudi Arabia, was hit by a Scud, killing 25 Americans and wounding over 100. The situation today is somewhat parallel. The US is saying to Israel, “Trust us, we’ll take care of Iran”, although it is doubtful that the US has the means to do so diplomatically or the will to do so militarily. And in no uncertain terms Israel has been told, “there will be big trouble” if it acts unilaterally. Not only that, but by refusing to sell certain weapons and systems to Israel, the US has even damaged Israel’s ability to threaten or deter Iran from attacking Israel, directly or by proxy. The difference is that today many Arab nations would be happy to see Israel attack the Iranian nuclear weapons facilities. It is primarily the US and Europe, worried about Iran’s ability to create disturbances in the oil supply, who are obstructing Israel’s right to self-defense. This entry was posted on Wednesday, May 27th, 2009 at 7:41 pm and is filed under General. You can follow any responses to this entry through the RSS 2.0 feed. Both comments and pings are currently closed. Times have changed. The Patriot was a flop, and the Patriot II was little better. However, Israel, in conjunction with Boeing and the US Navy, developed the Arrow anti-missile system. That led to the highly-successful Arrow 2 and Israel just got funding and a green light for the Arrow 3… state of the art for both Israel and the US. The Arrow 2 passed tests of shooting down a captured scud that was converted to mimic the Shahad 2… it was launched from the air and followed a ballistic trajectory. A perfect hit! Israel is about to go online with Iron Dome, which will knock out the short range missiles used by Hamas and Hizbullah. Once this occurs, Israel will have an intermediate-range and a short-range missile defense system that’s the best in the world. Israeli ships already have the Phalanx last-ditch 20mm gatling guns that automatically shoot down the ultra-close missiles that might get through everything else. Israel is talking about using these at target settlements and cities. We’ve come a long way from the nightmare Scud attacks you accurately mentioned. Our missile programs are looking good, as is our missile defense. The Iranian threat is clearly far greater than the threat from Saddam Hussein. The question of whether the U.S. will adopt a policy of denial and looking the other way is real one. If they don’t they will have to at some point directly deal with the nuclear threat. One of my worries ( Among many) is that they will do what we want them to do, take out the Iranian nuclear capability but that we in Israel will pay the price. It is of course possible to worry that the U.S. will do nothing. What seems to me most important is coordination between Israel and the U.S. This is precisely what the ‘distance ourselves from Israel’ people in the Administration do not want. I see one of Prime Minister Netanyahu’s important tasks is maintaining the close connection , so that the one surprised will be the enemy and not the ally. I simply cannot imagine the US taking military action against the Iranian nukes unless the situation changes drastically…for example, if an Iranian weapon gets into the hands of terrorists and is used against the US. This president– Obama– is too busy kissing up to the Arabs. I don’t believe he’ll ever be in favor of an attack against any Arab country. His huge priority is to bond with Islam (while Islam wages war against the world).